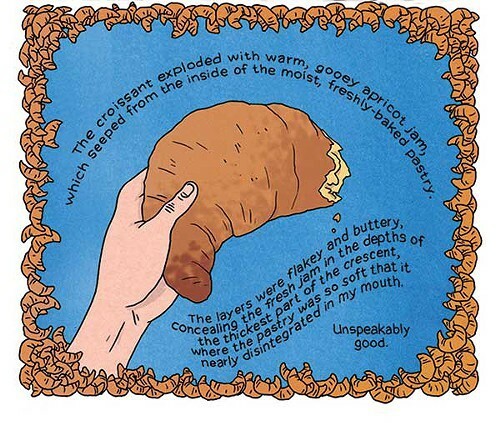 A page from Lucy Knisley's graphic memoir, Relish: My Life in the Kitchen. Knisley will appear at Oblong Books & Music in Rhinebeck on Thursday, April 4. Although we're just starting out, the Daily Dose is already evolving. While we love chatting about all of the great upcoming events in the Hudson Valley, we'd like to get some fresh voices in the mix. For next week's episode, Steve Leiber of Upstate Films will join us to talk about their upcoming events as well as some major transitions happening in the film industry right now that are affecting small, independent theaters like Upstate Films. We'll be integrating more interviews in our upcoming episodes, so keep a look out for special guests. The 8-Day Week Podcast will be available every Thursday here, on the Daily Dose, but you can also subscribe to our iTunes stream for on-the-go enjoyment. We hope that you do! Thanks for listening, and feel free to leave us some feedback.